major festival in Australia plus overseas at the acclaimed Edinburgh Festival and various locations overseas including the Fiji islands, Samoa and the Cook Islands. 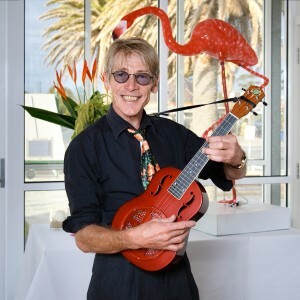 Alex started playing ukulele in the early nineties whilst in a duo with guitarist Nick Charles. The uke became an integeral instrument on all three albums they recorded. Alex went on to record two Hawaiian albums playing steel guitar, rhythm guitar and of course ukulele, a solo blues album also featured the noble uke on one track (Jelly Roll Baker) Alex brings to the workshop all of his experience, from first influence, George Formby to his many years friendship with the late multi instrumentalist Bob Brozman and their combined affection of pacific island music. From plectrum playing, to finger picking, taking in calypso, blues and early jazz styles, this is serious fun folks!